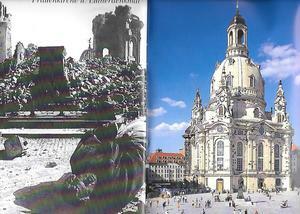 Dresden’s Frauenkirche after the 1945 bombing and today. Between 13 and 15 February 1945, more than 1,200 British and American heavy bombers dropped high-explosive bombs and incendiary devices on Dresden, Germany. For two days, the Frauenkirche (Church of Our Lady), affiliated with the Evangelical-Lutheran Church of Saxony, withstood the attack. Also, the church’s most distinctive feature, a 12,200 ton sandstone dome known as the “Stone Bell,” stood tall and strong. However, at 10:00 am on 15 February, the dome collapsed. Temperatures inside and surrounding the church reached 1,832 degrees Fahrenheit. As a result, the eight pillars supporting the dome glowed bright red and exploded. In addition, the updraft created by the incendiary devices produced hurricane-force winds. But shortly after World War II ended, the people of Dresden began collecting and numbering stones from the rubble for future use. Since some residents felt the ruins served as a necessary reminder of wars destructiveness, the massive pile of stones laid there for fifty years. Others, though, considered the site and eyesore. Time to move on. Therefore, several years after Germany reunited, reconstruction began, using the original 1726 plans. Workers finished the project in 2005, a year ahead of schedule. Both blackened, original stones and modern, light-colored sandstones comprise the current façade of the Church of Our Lady. This creates a mosaic of past and present. 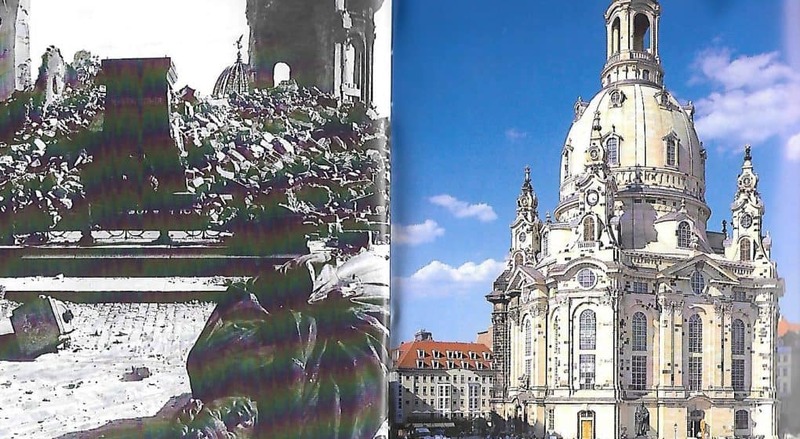 Most noteworthy, a son of a British pilot who dropped bombs on Dresden made the golden cross that crowns the dome. Today, the Frauenkirche interprets its reconstruction in the light of reconciliation. In fact, John 20:21 provided the motto for the consecration on 30 October 2005 – “Peace be with you .” On the other hand, author and pastor Max Lucado (Anxious for Nothing, Thomas Nelson, 2017) describes perpetual anxiety as “the mental alarm system that never turns off.” Rather than viewing God as distant and removed, we must affirm that God existed before all things – that in him all things hold together (Colossians 1:17, NIV). For the whole universe collapses if God steps back. Furthermore, to fight the onslaught of fret, we, like Joseph in Egypt, need to view life’s sufferings through the lens of divine providence. Otherwise, Pastor Lucado, stresses, anxiety winds up stalking you every day of your life. As with Joseph and his brothers, God used intended evil for ultimate good. God’s resolute in His plan to carry, as well as sustain, creation to its purposed glory. The Dresden Frauenkirche is the most beautiful house of worship I have ever seen, both inside and out. Not only for its physical splendor, but for the story of its reconstruction. Seeing the devastation of war in its blackened bricks side by side with the bright newer bricks is a powerful message of resurrection and reconciliation. I love the Frauenkirche. I would love to go back and see it again. This is such a beautiful analogy as well as educational. Ruth Hansen’s comment says it all. “WE EITHER GET BETTER OR WE GET BITTER”.